Many of our customers are familiar with Michelle Watts. We've been carrying her beautiful Southwest patterns for years and have several samples in the shop made from them. Join us this Thursday at 6 p.m. for a trunk show featuring Michelle and her work. She will show quilts and wearable art and have her entire pattern line available. The trunk show is free but seats are limited, so pre-registration is required. Call 970-565-7541 to put your name on the list. 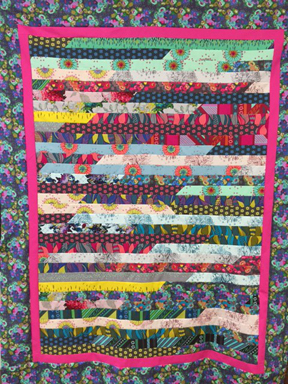 There is also still space available in the class Michelle is teaching on Friday for the Dolores Mountain Quilters guild. Get the details here. 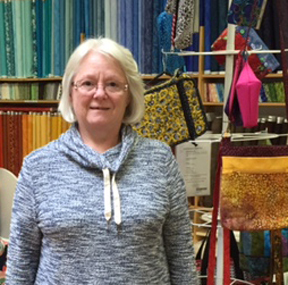 We're delighted to have Ann Sam as the newest full-time member of our team here at Cortez Quilt Company. Ann and her husband Ron moved here from Texas two years ago, and Ann has been taking classes with us for the past year. 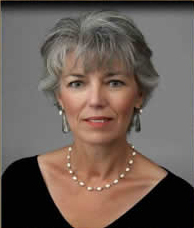 She is an avid quilter, BERNINA lover, mother of five, grandmother of nine, and an active member in her church. Come by and say hello to Ann! This bright collection arrived late last week. It came with coordinating jelly rolls and Ann quickly whipped up a 1600" Strip Quilt out of one of them. See that image below under "The Tip." We've had requests for LouAnn to teach the Vinyl Mesh Market Bag class again, and this time it's an Evening Make & Take. Join us for a fun end-of-the-week sewing night where you'll learn a number of tips, tricks, and modifications that LouAnn has made to this handy tote bag. The vinyl mesh is easy to work with and all the rage at the moment. Sign up today as the class is limited to eight students. Most of the other May classes are already full, but you can add you name to the waiting list in case there is a cancellation or for when we schedule another class. Imagine having this beautiful quilting machine in your home. 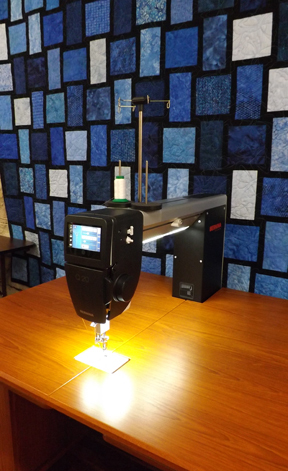 If you've been longing for a longarm, now is the time to act. From May 11 -16 you can save $500 on the amazing BERNINA Q20 - the best sit-down machine on the market. Not only that, we're offering 60-month ZERO percent financing (on approved credit, of course). Come in today to try out the Q20 and complete the one-page credit application. The Q20 comes complete with the Koala cabinet pictured here (also available in other finishes), it is delivered directly to your home, our techs come out and set it up, and we teach you to use it the same day. How easy is that? Create a series of mesh bags for your organizational needs. 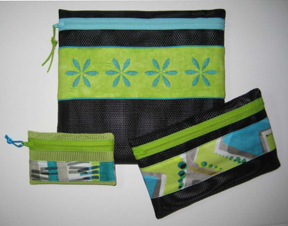 Select from a variety of mesh colors and fabulous fabrics to create a set of custom pouches. 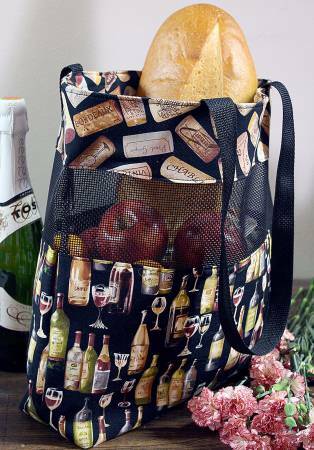 Add extra zing with piping and create your own customized fabrics. Techniques: Creating piping, binding seams, sewing vinyl mesh, EASY zipper installation. 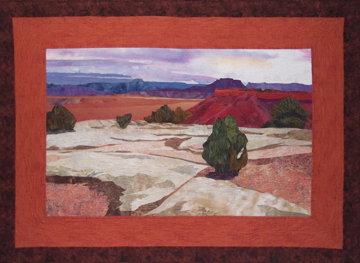 Salt Lake City quilt artist Susan Madden has been chosen as an Artist-in-Residence at Mesa Verde National Park May 2-15, 2016. Susan has been an artist for more than 35 years and currently creates landscape quilts. About 15 years ago while learning traditional quilting, she began to wonder if she could transfer her knowledge of landscape painting into working with fabric—if she could "paint" with fabric—and began to develop her unique style. Using applique and piecing techniques, she layers small pieces of fabric of different colors and visual textures to create realistic landscapes, which she then quilts on her home sewing machine. 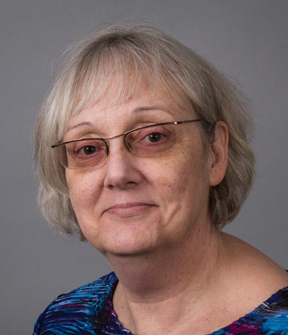 Susan will present a program for visitors at Mesa Verde on May 13, 2016, at 7:00 pm in the Chapin Mesa Museum Auditorium. In this interactive program, visitors will be guided to create their own artistic creations using bleach pens on fabric. Images demonstrated will be of petroglyphs in Mesa Verde. Participants will be encouraged to draw petroglyphs, mesa shapes, or Mesa Verde's unique ancient architectural shapes onto fabric using bleach pens. After the drawn image has developed and the bleaching process has been stopped, participants will be able to take home their creation, a reminder of their visit to Mesa Verde. 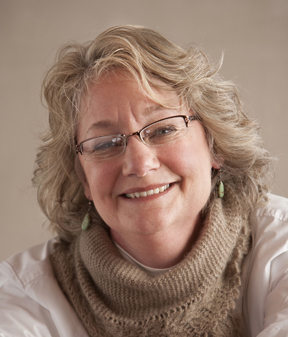 Internationally known knitter Ann Budd will be our guest to teach four classes, sign books and exhibit her knitted items on June 24 & 25. 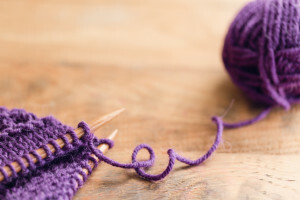 Classes include: Shadow Knitting, Intarsia in the Round, Socks at Any Gauge, and Fixing Mistakes. Each class will be 3 hours long. The book signing and trunk show will be the evening of June 24. Click here to download/print the flyer that includes all the details. When the bright new jelly rolls mentioned above arrived last week we wanted to make a shop sample to show off the fabric, and it needed to be something quick and easy. A 1600" Strip Quilt was the answer. If you need to make a last-minute graduation gift or a quick quilt for any reason, consider one of these. Here are the instructions. You can put the strips together in an afternoon. If you're adding borders (as we did here, and now it's ready to be quilted) plan on a full day of sewing. 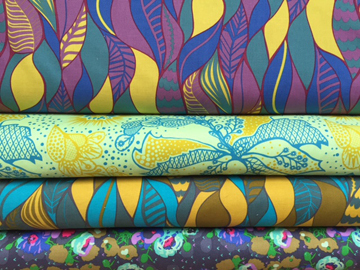 So, pop in today to pick up one of the new jelly rolls or dig through your stash where you'll probably find one that you "couldn't resist" somewhere along the line. Note: There will be no Thursday/Saturday demos in May.